This master class in writing children’s and young adult novels will teach you everything you need to know to write and publish a great book. The best children’s and young adult novels take readers on wonderful outward adventures and stirring inward journeys. 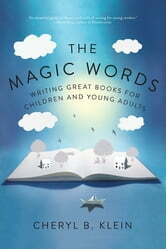 In The Magic Words, editor Cheryl B. Klein guides writers on an enjoyable and practical-minded voyage of their own, from developing a saleable premise for a novel to finding a dream agent. She delves deep into the major elements of fiction—intention, character, plot, and voice—while addressing important topics like diversity, world-building, and the differences between middle-grade and YA novels. In addition, the book’s exercises, questions, and straightforward rules of thumb help writers apply these insights to their own creative works. With its generous tone and useful tools for story analysis and revision, The Magic Words is an essential handbook for writers of children’s and young adult fiction.